How do people urinate and defecate in space? Do spacecraft have bathtubs or showers? The most difficult part is when astronauts are working outside their craft in a spacesuit. Spacesuits are fitted with diapers so that astronauts can work outside for long hours (especially during spacewalks). The rest of the time, though, it's still a bit complicated! You might be interested in this article which describes the life in the space station and answers most of your questions. I shall give excerpts from this article concerning your questions. First of all, toilets have various restrains (foot loops, thigh restraints, etc.) so that astronauts will not float away when using it. Also, due to weightlessness, the toilets rely on air and vacuum pump which creates suction to remove the waste. 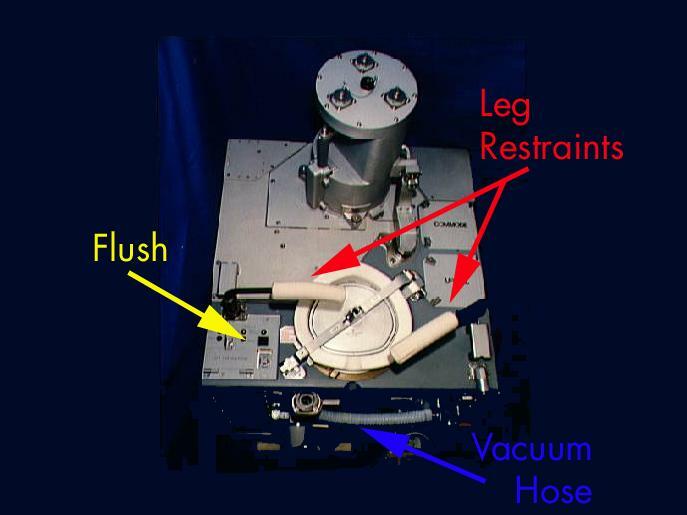 When urinating, astronauts use a large tube that is connected to the bottom front of the toilet. This tube also has air circulating through it carrying the urine to a holding tank. Anatomically correct urine funnel adapters are attached to this tube so that both men and women can use the same toilet. Here is a picture of a toilet in the space station. The space station has a full body shower unit. When astronauts want to take a shower, they step into a cylindrical shower stall and close the door. They then get themselves wet and wash up just like you would on Earth. However, due to weightlessness, the water droplets and soap don't flow downwards into a drain, they float about. Astronauts use a suction device to get rid of the waste water. Check out NASA's information on life in space. Page last updated on June 24, 2015.